The Jatiyo Sramik Jote is a national trade union centre of the trade unions is working for working-people�both organize and unorganized sector. 48 unions are affiliated with the Jatiyo Sramik Jote which has 56 thousand members. In addition to 48 unions the Jatiyo Sramik Jote has its units in many industries , offices and other working places. The Jatiyo Sramik Jote is working for trade union right of worker, rights to organize, better-wages, improvement of their living condition. The J.S.J. was formed on 12 October,1969 during the time mass upsurge against Pakistani rulers. It�s former name is Jatiyo Sramik League. It took a very active part in the liberation war and after the liberation played an important role in running nationalized and abandoned industries and enterprises. 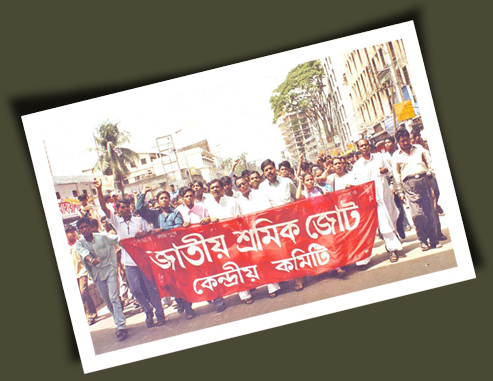 After the liberation of Bangladesh, the trade union movement underwent two important phases. One is from 1973 to 75. 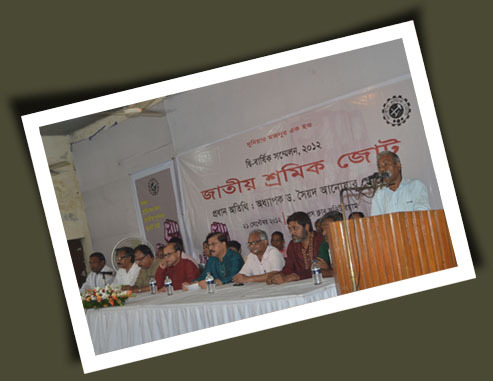 Five trade union centres united in movement for trade union rights, against atrocities and terror by the government supported trade union organizations. Another phase is from 1978 to the present times. A broad based alliance of all trade union centres, after the imposition of Martial Law and banning of all trade union activities in 1982 and successfully launching a movement. Which forced the government to come to an agreement with trade unions and to give trade union rights. In this movement unprecedented unity among the working class in the organized sector has been established. The SKOP (Alliance of Workers and Employees) fought not only for wage increment and trade union rights but for democratic rights as well. Copyright (c) jatiyosramikjote.org. All rights reserved. Hosted by Idea Media.